For over 200 years, prints have been put up on walls and used to announce, inform, to advertise, to protest, and to provoke. Now, Billy Ma is turning the form on its head and producing exquisite fine art prints with a message instead. This Taiwanese-born, Canadian-raised, Italian-influenced (Billy grew up in a predominantly Italian immigrant community which has led to him to “still talk with my hands too much”) and Singapore-based illustrator, painter, sculptor, designer and art director has been producing iconic artworks under his label, Booda Brand, since 2009, and collectors can’t get enough of them. 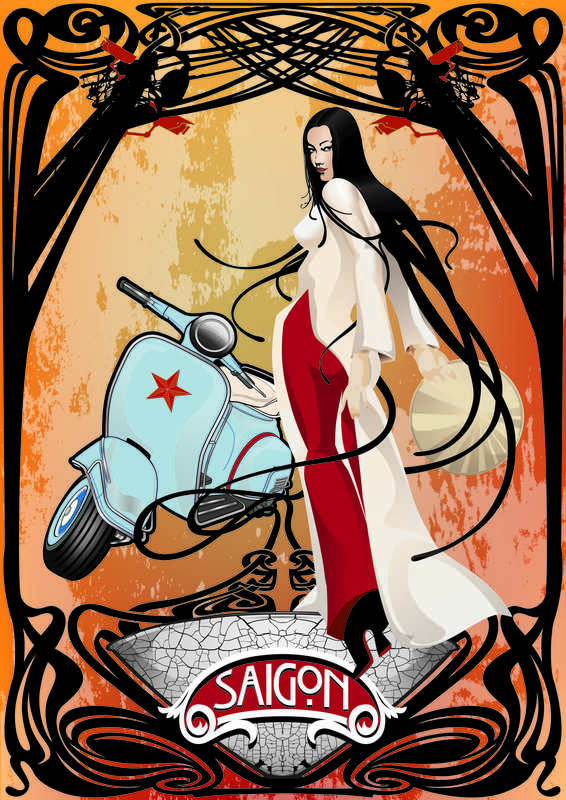 Arty-Fact: The people of Ho Chi Minh City still call it Saigon. Colonialism aside, the blend of the French and Vietnamese culture makes Saigon an exotic gem in Asia. The art nouveau style represents the delicious sinuous noodles from the iconic lacquered egg shell bowl of famous pho noodles. The lines undulate up to form the chaotic jumble of the utility lines that echoes the same chaotic symphony of the traffic below. It’s hard to go past his striking illustrations with their bold use of colour and typography. “I always start with hand drawings of my ideas. Then they’re scanned into the computer where a rigorous process of experimenting with different colours, textures and compositions begins,” says Billy. The results are quite stunning. Although these are obviously contemporary pieces, there is something quite familiar about their look and feel. Arty-Fact: The 30’s and 40’s in Shanghai was a cultured and daring era. Beautiful curvaceous women of strength and sophistication were “de rigueur”. The Shanghai Deco style in design and architecture stood as a beacon of Shanghai’s refinement. Today as Shanghai forges ahead in the name of progress, its historical aesthetic is casually forgotten. “The vintage style is completely unintentional. I think my lifetime of studying art history has affected my style organically. Many people have called it retro contemporary,” says Billy. He’s referring to the beautiful composition of his pieces and how symmetry plays a big part in evoking that. But these are not just pretty pictures. Arty-Fact: Majulah is Singapore’s motto, “upward and onward”. Majulah pays home to the imported foreign workers on whose back the bright, shiny city is built. Their symbol is the ubiquitous yellow rubber boots. If you look long enough, you’ll see their twisted bodies holding up the Lion City. Arty-Fact: A continuing series that examines the absurdities of today’s socio-political world. Gunz and God merely asks profoundly if a loving and caring God had given man the right to bear arms as outlined in the USA’s 2nd Amendment. The imagery depicts the very instance when God touches the hand of Adam in Michelangelo’s Sistine Chapel mural, thus giving him life. Instead we have God handing Adam a bullet to go forth and propagate violence and killing. In the background, you have the relentless military industrial complex. Cherubs with kevlar vests symbolizing innocent lost souls as well as the dove of hope and peace. Arty-Fact: An ironic scenario that understands karma to be a life-long practice and pursuit. 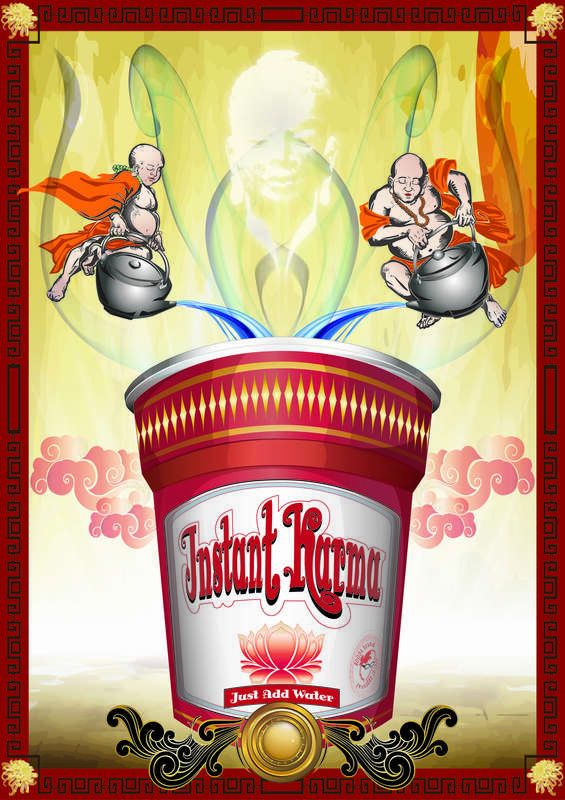 Yet today we all want everything instantaneously just like our instant noodle soup. There is something very powerful about original prints and their ability to connect people to a social commentary that fine art struggles to respond to so immediately and liberally. “My collectors are not afraid of owning a piece of art that can be confrontational or speaks volumes about who they are and what really turns their crank. I guess I’m just not cut out to draw landscapes and pretty flowers and butterflies.” And we thank Booda for that! To find out more about Billy Ma’s limited edition prints, contact Addicted Art Gallery.